A Quiet Corner: Lady Kiera Von Pooh in KPT: I Got It Mom! Lady Kiera Von Pooh in KPT: I Got It Mom! Have you ever taken your puppy to KPT? That stands for Kindergarten Puppy Training...cool, huh? 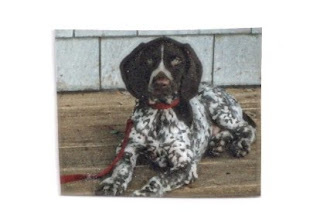 Well, way back when my GSP (German Short-haired Pointer) was eight weeks old, I signed her up for KPT, a six week course. The breeder I had gotten her from had mentioned it to me while I was patiently waiting to pick her up from the kennel. She was eight weeks old. Kiera and I attended classes eagerly and faithfully. We never missed one. We paid attention to the instructors and practiced several times a day after I got home from work. During those six weeks, we learned how to work as a team. You see, when you take your dog to obedience classes, both the handler and the dog learn. The main objectives of this course were to teach the basics: sit, down, stay and heel. Now I will admit there was one looser in the class...not the Cocker Spaniel...the owner! She came to class wearing these monstrous clogs with wooden heels (and she was not exactly petite herself)...if you know what I mean! One night, as she was parading around the room, she stepped right on Kiera's paw! I was so mad. You should have heard the way Kiera cried! After that happened, the instructors asked her to move into an area where the dogs were bigger...thank goodness! However, I must admit, I still wanted to trip her every time I saw her just to get even! Anyway, Kiera and I went to all the classes and we tried our best. We worked pretty well together as a team. Then came the last night...the night we were going to get our graduation certificates. When we got there, Rita and her partner, Heidi, announced that before receiving our certificates, we had to walk our dogs across the room, give them the command to "down stay", then walk back to the other side, standing opposite from them. They were looking for the dogs to do a five minute down stay. Kiera was doing fine. Now remember she was fourteen weeks old. But she was right there with the "big boys" holding her "down stay" like a real trooper. It had gotten warm in the room so Rita turned on the ceiling fan. One of the things we, as handlers, were taught during the course was to anticipate your dog's behavior and to always keep your eye on your dog. Well, I anticipated alright. I think we were into the down stay for about three or four minutes when it happened. I saw Kiera's eyes suddenly shift her attention to something moving across the floor. She remained fixed on it as it danced across the waxed hard wood. It came closer and closer to her. I knew we were in trouble. Well, just as that darn old dust ball got within her grasp, she broke the down stay, pounced on it, picked it up and trotted across the room so regally as if to say, "look what I caught Mommy", with her head held high! No, we didn't win the exercise this time. But we graduated!! Now we were ready for Intermediate.